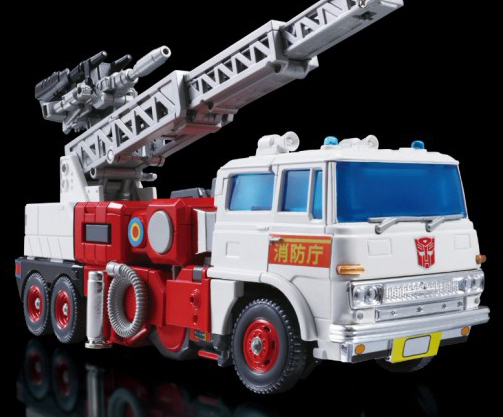 Takara: Transformers Masterpiece MP-37 Artfire Out of Nowhere! Posted by Jon in News, Takara, Transformers with 1 comment. Last night I went to bed thinking about how Death Stranding is going to be the best game ever made. Never did I expect to wake up to an official announcement of the third use of the MP-33 Inferno mold! Artfire and his Targetmaster Nightstick are officially MP-37 and will be released in May 2017! Official pictures have already been released and some shops have begun to take preorders. It’s gonna be agony waiting till May, but I think I want this guy even more than MP Megatron. I’ve never had an Artfire, and I thought the only thing I didn’t like about MP Inferno was that he’s so red he’s boring. This color scheme is magnificent. Plus, I adore little tiny extra guys!